Welcome to Bacteria World, the online source for educational resources for the bacteria enthusiast. This site features a variety of impressive pictures of bacteria, including images of bacteria forming biofilms, bacteria interacting with other cells and structures. Browse by topic, or use the search tool to find the specific material of interest. Bacteria are single cell organisms that serve a variety of functions that are vital to life, and at the same time can threaten human life. 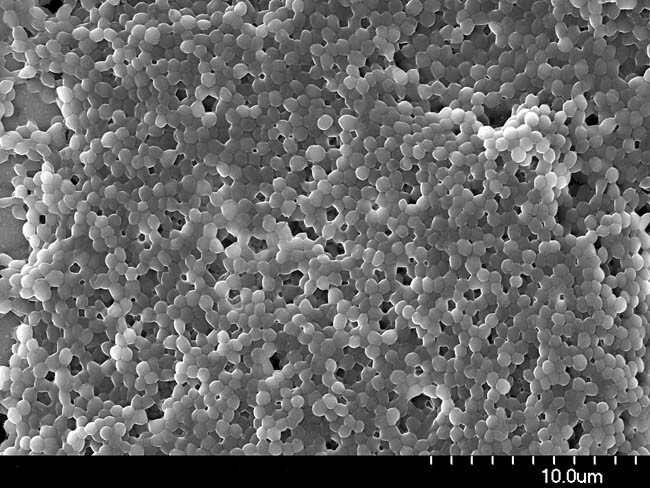 A typical bacterium is between a few tenths of a micron and several microns in size. They come in a variety of shapes, but two common shapes are spherical (Cocci), and rod shaped (Bacilli). Bacteria are beneficial in the production of foodstuffs like cheese, yogurt, sour cream, buttermilk, vinegar, and wine. Bacteria are responsible for various fermentation processes used in making these products. In addition, bacteria play an important role in the proper function of the human digestive system. Bacteria are detrimental when they lead to infection. Common bacteria induced diseases include cholera, tuberculosis, anthrax and bubonic plague. Bacterial infections are typically treated with antibiotics. Extensive, and often unwarranted use of antibiotics have led to the emergence of new strains of antibiotic-resistant bacteria. Some feel that the emergence of these new strains of bacteria are a major threat to human health. Bacteria are ubiquitous. They can survive and thrive in environments that would be incompatible with other forms of life. Bacteria can feed on a wide array of material, including plastics and a variety of organic material. Copyright www.bacteria-world.com. Contact curator@bacteria-world.com. We welcome your comments. In addition, we welcome user contributed material to improve this educational resource.